Photo courtesy The Daniel Castro Band. (From left to right) David Perper (drums), Daniel Castro (lead guitar, lead vocals), Johnny Yu (bass). In the music industry today, there are a lot of music genres that have come full circle over their incarnations of the past. Country music was once a niche genre but today it is featured on pop radio stations right alongside every other popular song. Other genres like dance and even newer music types like dub step are making their way into the popular music realm. Despite this trend, one genre of music has never really made it out of the underground even though its influence can be felt in just about every song on the radio. The blues is a music genre that many people don’t seem to be familiar with and don’t realize how much it plays a role in their favorite songs. Still, good old-fashioned blues music is all around us, it just takes a little bit more awareness to enjoy. On Saturday Feb. 25, The Daniel Castro Band was featured at the Torch Club in Sacramento. According to his website, Daniel Castro began playing the blues at the age of 12 and really got into the blues scene while living in South Central Los Angeles. After touring the U.S. with many legendary blues artists, Daniel began playing in the bay area of California in 1989. In 1995, Castro moved to the bay area, he resides in San Jose currently, and formed The Daniel Castro Band. He’s played venues from the California coast to Chicago and even Japan. For me, the connection with The Daniel Castro Band is much different than the average blues fan. Aside from the fact that Castro has played with many of the greatest blues singers to ever grace a stage, he played with one man who is very special to me. If you’re a fan of the blues, especially bay area blues, then you’ve probably heard of Johnny Nitro and the Doorslammers. Johnny Nitro was my uncle and after he passed away on Feb. 19, 2011, my family and I attended a tribute show to honor his life. The tribute show, which took place March 30, 2011 in Redwood City, featured dozens of blues artists who were either Doorslammers over the years, played with Johnny or were just good friends of my uncle. Aside from that night featuring tons of amazing artists including the ex-wife of Johnny Nitro, Silvia Cicardini, The Daniel Castro Band stole the show with their amazing talent and unique sound. The best part of their performance was a brand new song that Castro debuted for the first time ever. The song was a tribute to my late uncle and it’s one of the most amazing songs I’ve ever heard. The song, which is from the perspective of Johnny Nitro, features a hook that gets the crowd involved and really captures the essence of what helped my uncle touch so many people’s lives. It’s a song I cannot describe in words and if I could, I’d still suggest you listen to it anyway. From the guitar riffs to the perfect baseline to the drums that tie it all together and of course, the witty and touching lyrics, the song is truly a masterpiece. So, when I heard that Castro was playing the Torch Club in Sacramento, I jumped at the opportunity to go hear the song live again. Not only did Castro and his band play the song, they put on a show that I’ll never forget. Performing songs from his 1999 “No Surrender” album along with others, Castro and his band which consisted of Daniel Castro on lead guitar and vocals, Johnny Yu on the bass and David Perper on the drums blew the doors off the Torch Club. The best part of the night was when Castro transitioned into a light melody on his guitar and told the story of Johnny Nitro. He led into the tribute song from there and the bar patrons were definitely into it. It was a wonderful feeling seeing my dad happy as he sang along with the song and played air guitar. My wife and I sang along and the crowd got heavily involved. Castro told a story about how my uncle once told another blues legend, Tommy Castro, when asked why he never traveled the world that he didn’t have to because he played in San Francisco and eventually everyone comes to San Francisco. After the song, Castro pointed out that my family and I were in attendance and we got a huge cheer from the crowd. Overall, it was an amazing experience. Despite being non-drinkers, the bar atmosphere and being around blues fans, many of whom were Johnny Nitro fans, added to the performance in a way that is hard to describe. Being in close quarters with passionate fans who were dancing and tapping their feet to the music and cheering as the drums and beautiful melodies of the guitar and base combination rang from the speakers was a feeling like no other. 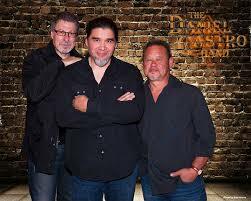 The Daniel Castro Band is definitely an act that any fan of music, especially blues, owes it to themselves not to miss. Even though blues music may not be prominent on the airwaves, I think it’s better that way. The blues were meant to be experienced in a small building, right in front of the stage, on the dance floor alongside other passionate blues fans. For more information on The Daniel Castro Band, visit the band’s MySpace page or for information on Sacramento’s Torch Club, visit its official site. This entry was posted in Arts & Entertainment, Sac City Express (SCC) and tagged band, bar, blues, castro, club, daniel, downtown, johnny, music, nitro, review, sacramento, scene, torch. Bookmark the permalink.